Last week, while on a mission to get a few treats from a supplement store for a visiting friend, I ended up leaving out with a shaker cup, protein and to my surprise a great laugh! I walked up to the counter and noticed this handsome spray tanned man with the tightest polo shirt on that I have ever seen and the words “nutrition expert” printed on the sleeve. This “expert” then asked me if I took a multi vitamin which to me, seemed as if he was trying to break the ice. After I said yes, he attempted to sell me some cheap jug of protein powder and a post workout amino acid powder complex. I quickly informed him that I simply wanted to buy the cup and bar for my friend and that was all. He then proceeded to push a separate drinkable dietary supplement to me which apparently restored glycogen faster than any other macronutrient (food). Now I don’t know all the answers and especially when it comes to supplements. However, I informed the man that there whole supplement store was virtually a disgrace and that if I wanted advice, I would seek out a Physician, Strength & Conditioning coach, and a certified Dietitian. I told him that pushing low grade micronutrient based products is no joke to the everyday consumer. I informed him that the FDA in America literally has little to no control over the ingredients in some of these products until a slew of people die or become sick from them. I then proceeded to tell him that each of the products in his store have about a 10-15% variance on their Net quantity product panel label which means that any product can have added amounts of ingredients without having to inform the consumer. Lastly, I informed him that many of the serving sizes are comparable to a 300lb man and not a 165lb lean male or a 120 lean female who may have a family history of high cholesterol and heart conditions. The FDA does not distinguish serving quantities as they only want to “know” what the entire product is compiled of. Individual companies are not influenced by the FDA when they make their ‘scientifically’ subject serving sizes. With this in mind the “nutrition expert” listened diligently, handed me my receipt and remained silent as I walked out the door. This was not the first time this has happened to me or my clients. 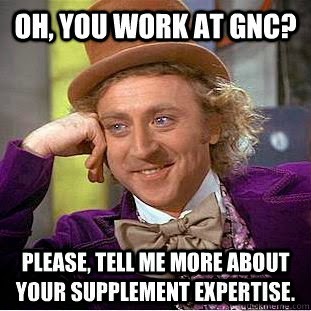 I have heard numerous stories of clients going into GNC only to come out with 3-4 more products than they bargained for and confused yet excited that they will lose weight and add muscle mass. Give me a break. The worst thing an uneducated person can do if they are trying to positively change their lifestyle is to start by going to a supplement store for advice. Yes, there are some educated and informed people at about 20% of these stores (you got to pay the bills somehow!). But as for the remaining 80% of “nutrition experts” working in supplement stores who really just want to sell you a product and act like a doctor, stay clear! They don’t care if you drop dead tomorrow as long as they can show their managers that people are buying product. My advice to you would be to first talk to your family Physician, then consult with a Personal Trainer and a Dietitian with specific needs and questions you may have. Do not start the change with $200.00 worth of supplements which may harm you in the long run and which you really know nothing about.